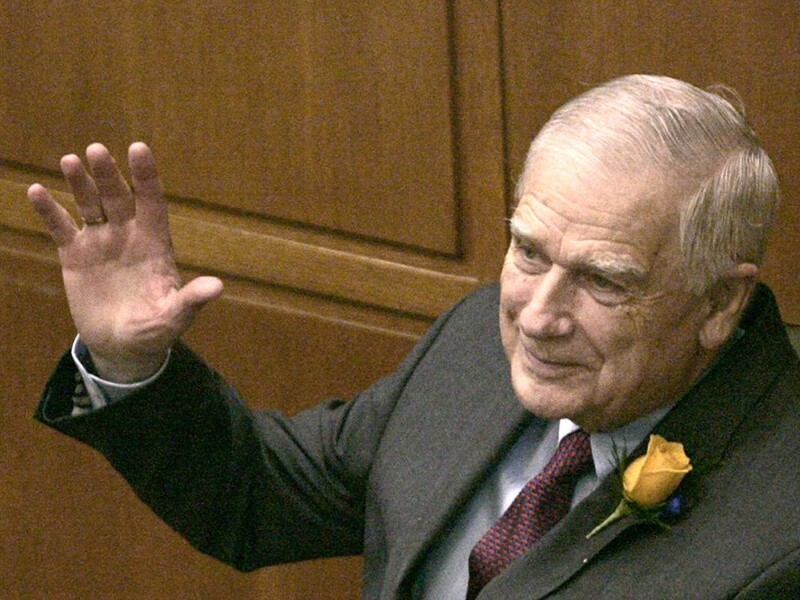 Some people called former Oregon Sen. Mark Hatfield, who died Aug. 7 at age 89, “Saint Mark” for his outspoken Christian faith and his teetotaling habit. Hatfield was a man of integrity, but a saint he wasn’t — and thank goodness for that. He was the kind of leader many of us wish we had now precisely because he was not an ideologue. He was a pragmatic politician, skilled at negotiating the murky territory between doing what’s right and doing what works. Oregonians of my generation grew up with Mark Hatfield. He was Gov. Hatfield when I was in grade school. The timber economy was booming, and our young governor was popular and well-respected (not to mention dreamily handsome, something even an 11-year-old could appreciate). My father, a blue-collar Roosevelt Democrat, grudgingly approved of Hatfield, although he considered him one of the species of smooth-talking politicians who plays too much golf. When I left Oregon for college in 1970, I was drawn to the burgeoning environmental movement, and my admiration for Hatfield waned. I was alarmed, like many Americans, at the widespread clear-cutting of federal forests in the West — a policy Hatfield embraced — and I faulted him for what seemed to me his blind support of Big Timber. When Congress passed the controversial “timber buyout” legislation in 1984 — an effort spearheaded by Hatfield — many of us saw it as an unjustified bailout of the timber industry. The law allowed companies to withdraw from high-priced federal harvest contracts they’d agreed to in the heady 1970s, when timber prices were high. By 1984, prices had bottomed out, and nobody could log those sales profitably. Since those days, I have come to see the situation in a more nuanced light. Hatfield understood that in the West and Oregon, where more than half the forests are federally owned, timber had been essentially a public-private enterprise since the late 1950s, with the Forest Service a key player. This partnership seemed logical to most in the region through the ’60s, ’70s and early ’80s. Hatfield believed that a stream of federal timber could soften the ruthless booms and busts of a resource economy. The buyout eased a vital economic sector through an exceptionally rough time. Today, I believe Hatfield did the right thing. I finally met Mark Hatfield in 1998, soon after he had retired from the Senate. I was working for the College of Forestry at Oregon State University, and we had received a gift of valuable forestland. Dean George Brown decided to sell the land and use the proceeds to build a new research lab. That decision, to sell the forest — and to a timber company! — rather than to keep and manage it, earned Dean Brown the bitter enmity of some of his faculty. Brown and Hatfield were friends, and I wondered if they compared notes about how it felt to take an unpopular stand. Gail Wells is a contributor to Writers on the Range, a service of High Country News (hcn.org), where this column first appeared. She is a science writer who lives in Corvallis, Ore.